In a new study published in the New England Journal of Medicine, researchers from the University of Chicago Medical Center and the University of Arizona have shown that substances found in house dust in Amish homes have a profound impact on the development of the body’s innate immune system in ways that protect children from asthma. Revealingly, the same could not be said for Hutterites, who share similar ancestry, lifestyles, and cultural values. But it’s the differences between these two farming communities that shed light on the reasons why. The American Amish and Hutterite communities were established by immigrants from Central Europe in the 18th and 19th centuries. Consequently, they provide an incredible opportunity for scientists to conduct comparative analyses; the Amish and Hutterites not only share genetic ancestry, they also share similar lifestyles and customs, such as a Germanic diet, having large families, breastfeeding, drinking raw milk, not allowing indoor pets, and favoring childhood vaccinations. But these communities differ in one very important way: they engage in different farming practices. The Amish still cling to traditional methods, such as living on single-family dairy farms and relying on horses for fieldwork and transportation. The Hutterites, by contrast, live on large communal farms and use modern, industrialized farm machinery. 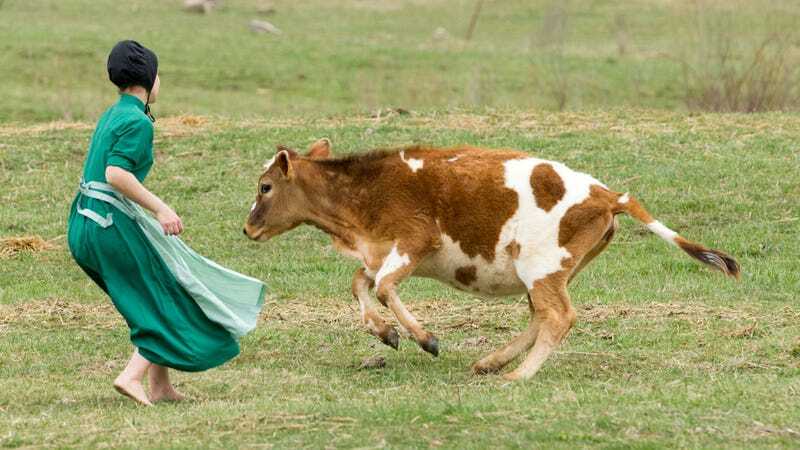 As a result, Hutterite children aren’t exposed to farm animals to the same degree that Amish children are. To figure out what’s going on, the researchers studied 60 Amish and Hutterite children aged seven to 14. In addition to performing genetic analyses, the researchers compared the types of immune cells in their blood, collected dust from their homes, and measured the amount of microbes in the homes of both communities. A key discovery was the presence of neutrophils among Amish children—blood cells that are crucial to fighting infections. They also found a lack of eosinophils among the Amish, which promote allergic reactions, such as inflammation. Genetic analysis also showed that Amish children have a more reactive immune system. In a follow-up to these findings, immunologist Donata Vercelli exposed genetically modified mice to house dust extracted from the homes (these mice were engineered to have weakened immune responses). She found that the airways of mice exposed to Amish dust were protected from asthma-like responses to allergens. The same could not be said for mice exposed to Hutterite dust. The dust collected from Amish homes contained more microbes—6.8 times more to be precise.